A collection of hard rocking guitar based instrumental tracks for film, gaming,TV, radio, podcasts and your personal home or car hi-fi system! 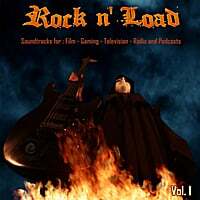 "Rock n' Load - Vol. 1" features 10 ripping guitar based instrumental tracks to bring your film, gaming, TV, radio, or internet podcast soundtrack to life. Music fans can also groove to the sounds at home, in the car, or jogging at the beach. The full album download contains 2 versions of each track; Full Length and a 30 second quick edit (which is ideal for shorter commercial spots). Designed to give your visual or audio art a sense of action and epicness with tracks like "The Knife", "Spiders" or "Gandalf", Rock n' Load Vol. 1 also offers a splash of feel good vibes with Blues, Funk and Psychedelics on "Tipsy", "Blue Tattoo" and "FunkedUp". Whether choosing to slice, dice and mash up the tracks for your visual artwork, or to slap in on loop and groove to the moods, Rock n' Load Vol.1 atmospheric soundscapes will take you on a journey to the world of rock and roll.